he was very convincing. that if i sign the agreement, there will be no Christmas this year and i'm not obliged to give anyone a gift. "anyone?" not happening, i tell you. i've been promising myself i won't observe Christmas anymore but what do i do? i still go ahead and buy gifts for my grandchildren. hey, mr. grinch! i still have to give the grands gifts, that's the exception right? right? hey! combining the november word 'agreement' for today with week 47 of the 52 portraits of me challenge the prompt of which is "surreal". sometimes i can't believe how those people could come up with these prompts. so i came up with this idea of striking an agreement with mr. grinchy green. we're old buddies, as you can see from an old photograph of ours. 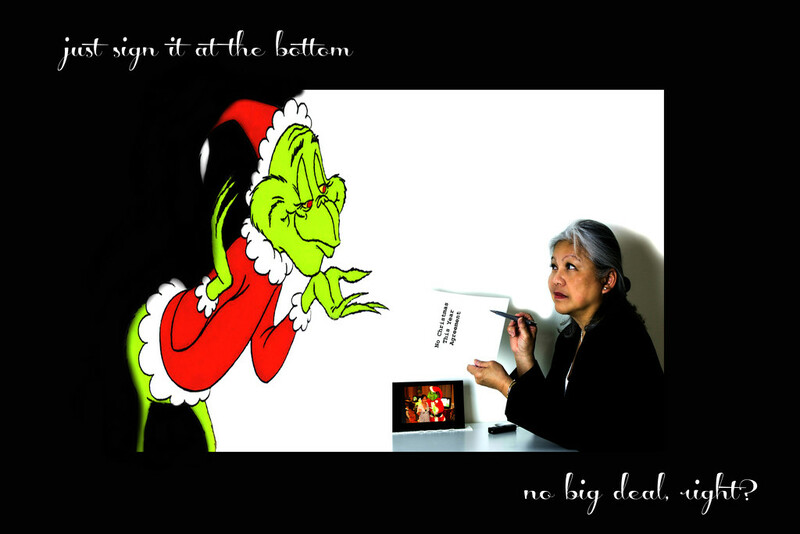 the big grinch image was grabbed from the worldwide web's google images. the photo of the grinch and me was taken in 2010 at a Christmas party i attended with the two grandsons - nobody wanted to have a photo with him and he was rather ecstatic when i asked. the black background was intentionally left unfinished. This is great, you really are very artistic. Sheer brilliance... wish I could get away with avoiding Christmas... it’s getting positively ridiculous! This is amazingly dear to my heart. I’d love to skip the holidays except now I realize my mom and grandma were probably as achy and exhausted as I am now and always made it happen for me. This is brilliant, such a great concept. I did cancel Christmas one year and we then did years of helping at a Christmas meal for people who'd be on their own. Utterly brilliant! You are so funny/serious... artistically and technically accomplished. FAV x 1000. We have a pact with our children and partners: only small inexpensive gifts. As a group we then decide what charity we want to support and individually decide how much we can afford to contribute. Resources are then pooled to make a large donation. Love it - this has been beautifully done and really made me laugh, except it has a tale. Awesomely creative. I love, love, love this. Of course, grandchildren are an exception. Very nice, funny, and creative. A beautiful processed card. Fav. You have so many creative ideas and then actually carry them through. This is so very good and I often wish someone would put some such agreement in front of me. The thing that gets me most is people thinking I am responsible for coming up with, monitoring and organising ideas for all my family. Wouldn't mind so much if I could just do my own shopping. You are so creative! Christmas when I was young was having a meal together with family, visiting other family, going for a walk and to the church. There were no gifts involved. Now living in Britain, it's a different culture all together and it's hard not to get sucked into this craziness. I like how you often incorporate yourself in your clever photos. We made Christmas low-key a long time ago. For us it was never about the shopping or gift-giving anyway. It was about the One whose name starts it off. This is very clever, but that is not surprising!